I am in the midst of catching up with the edits from a very busy wedding season. Seems getting married is back in fashion. Either that or couples have decided to stop rebelling and keep parents happy. Keeps the office busy. I edited this one. Dan Galic and Rob Leslie shot this wedding. The music is from Plants and Animals off their Parc Avenue album. I am particularly fond of this album because it is such pretty music and it happens to feature a panoramic photo of my old neighbourhood in Montréal as seen from the roof of our apartment or one just a couple of doors over. We never plan on living in trendy areas. It just happens. I'm so getting this job. This is the first postcard I've received as a result of my postcard project. It is from Erin of the Oh Honestly Erin blog, which is very good and worthy of your attention. 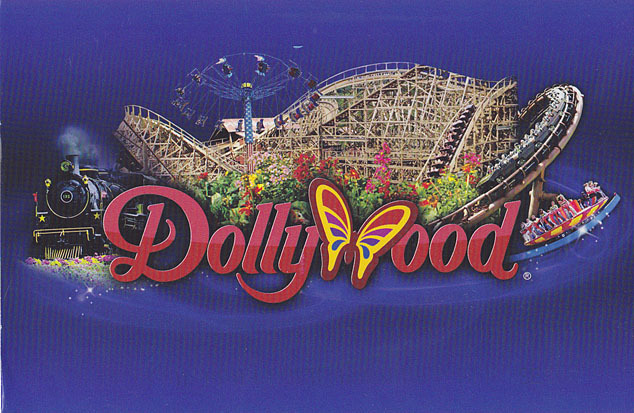 Carrie has always wanted to go to Dolly Wood. I am not a huge fan of amusement parks, which I know would disappoint Erin. I've just never liked rides. Partly this is due to my father not liking them, despite being more than willing (as I am) to jump out of an airplane or jump into an aerobatic plane. Something about rickety roller coasters run by carnies gives me the willies. Also, when I was about 10 or so, I lived in the shadow of West Edmonton Mall and remember the Mind Bender roller coaster disaster. 3 dead kids solidified a healthy fear of rides. But I do like birds, other than parrots which are pretty, but terribly annoying and not at all pleasant. 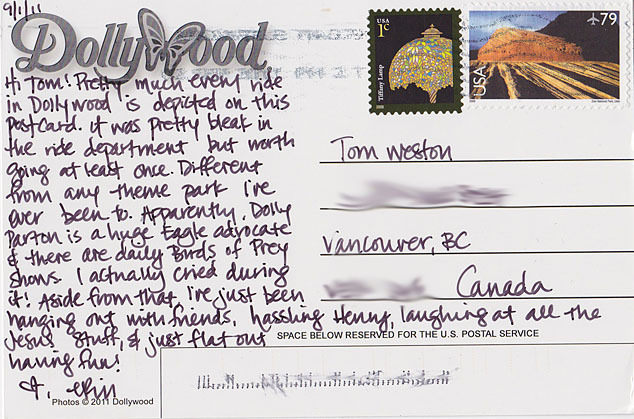 Thanks for the postcard Erin. 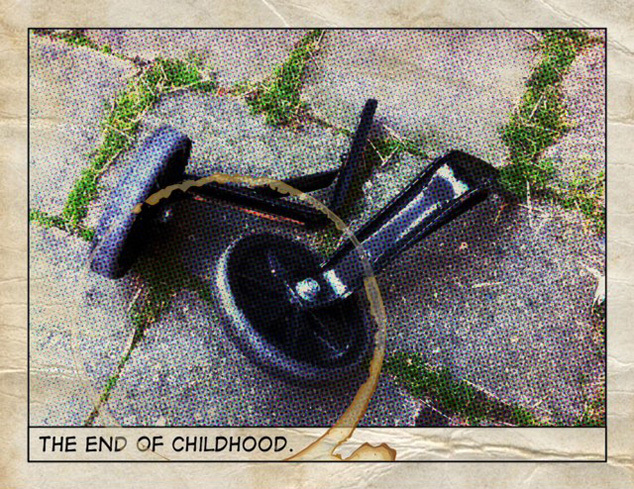 When I was less than 5, two things seemed impossibly adult to me; drinking coffee and losing those precious training wheels off of my bike. I remember how painful it was to learn to ride a two wheeler. It was an experience full of deceit, pain, screaming, and blood. Drinking coffee was an acquire taste, but much easier overall. Now I drink coffee several times a day and bike to work on a two wheeler. I suppose my less than 5 year old self would be duly impressed. I have recently joined modern times and found myself an iPhone - Hand Computer. Here is my first video during yesterday's lunch break at one of my favourite spots downtown. I like boats and planes and helicopters and dogs and strange people. This park has all of that.